Susan’s mission is to contribute her passion and expertise to every opportunity in her practice toward a vision to rekindle the long-standing notion of community, wherein families thrive in supportive environments. She believes that physical design can reinforce health and wellness by embracing diverse collaborations and collective inspiration toward new ground in design. Her projects in healthcare and other practice areas, in various cultures all over the world, have each contributed to new paradigms in patient and staff-centred environments. 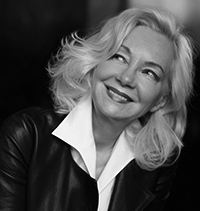 Susan is the founding partner of Perkins Eastman Black Architects in Toronto, Canada. With over 25 years of professional experience, her work spans the full range of large-scale master planning, architecture and interior design. Healthcare is a serious focus of the firm. Creativity, inclusivity and collaborative initiatives have resulted in new approaches for projects serving specialty acute and complex-continuing care hospitals, dementia-friendly and children-friendly environments, and ambulatory facilities throughout the world. 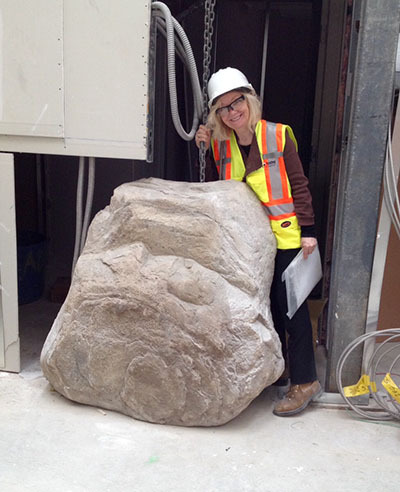 Aligning with a research study on what women would like to see in their new hospital, including First Nation’s references to the ‘wise women’s home’, Susan explored the pre-Cambrian shield in Ontario to source a huge rock. Hence the photo - ‘Gaia’ is in the building! On the construction site for Women’s College Hospital , Toronto – Gaia is in the building!